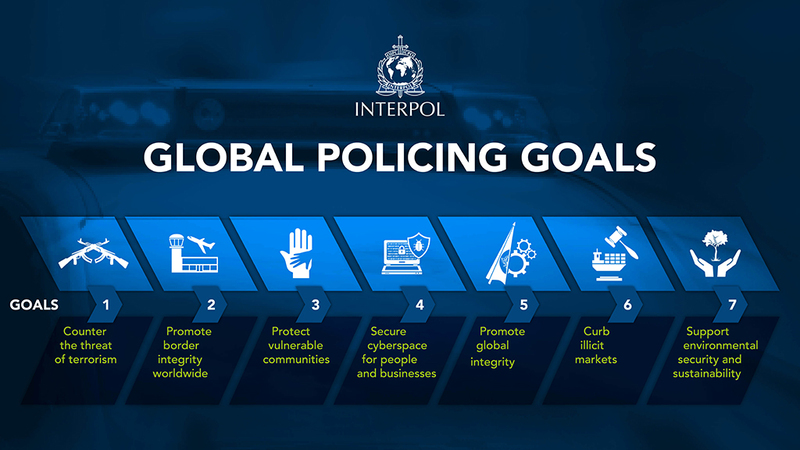 Our seven Global Policing Goals shape how the law enforcement community works together to create a safer world. As the only police organization that works at the global level, we play a unique role in supporting international policing efforts. To do this in a consistent manner across the world, it is important that all actors in the global security architecture work towards the same outcomes. We have developed seven Global Policing Goals which address a range of issues related to crime and security. They are aligned with the United Nations 2030 Agenda for Sustainable Development, especially Goal 16 “Peace, Justice and Strong institutions”. Universal, ambitious and underpinned by collective action, the goals form the basis for advocacy before national governments and intergovernmental actors of the global security architecture.